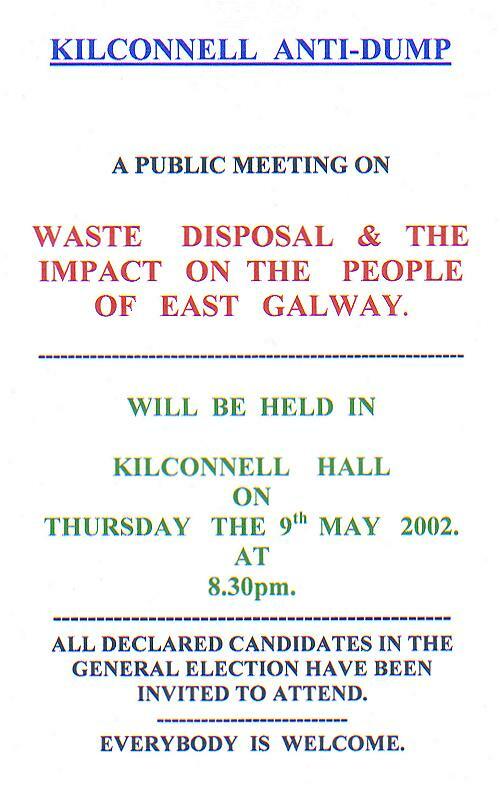 According to fairly recent newspaper reports, a large company named Celtic Waste have already paid down-payments of £500,000 to a small group of local landowners for the huge rubbish dump they plan to set up in the Kilconnell area of East Galway: large enough possibly to serve the whole Province of Connacht (roughly one-quarter the size of Ireland). The site Celtic Waste plan to build their superdump on almost touches the Esker Riada ridge: which, from a human history viewpoint, is thought to be Ireland's most important natural monument. Clonmacnoise, the world's first major Christian university, and probably the most influental as well, is approximately 25 miles to the east (at the point where the Esker Riada and the River Shannon intersect). The general area surrounding the proposed Celtic Waste site near Kilconnell is unusually rich in ancient monuments, largely because of the Esker Riada which has been in use as "An Slí Mór" ("The Great Road") across the middle of Ireland for thousands of years. The actual site for the proposed rubbish dump is itself closely surrounded by a circular group of ancient monuments which have been formally listed in the "Archaeological Inventory of County Galway" (ISBN: 0-7076-6179-X). In addition, the lovely ruins of Kilconnell Friary - amongst the most attractive in Ireland - are just a mile or so to the east of the proposed Celtic Waste superdump site. Woodlawn House is also within a mile or so to the north-west of the site Celtic Waste have earmarked; and, speculative plans to have this beautiful and historic set of buildings restored and made into a good quality hotel complex are being severely hampered by the threat of the Celtic Waste superdump (and the colonies of rats, flies, and scavenger birds which are normally a feature of such places). As a further "turn-off" for potential investors, there is also the matter of the obnoxious odours that can be expected to waft all around the nearby area: especially during warm weather. There are compelling reasons for believing that the successful development of the Woodlawn House property (which is literally falling to pieces at the present time) could have huge long-term benefits for the local community. One architect's written report suggests that if nothing is done about it soon, the ongoing deterioration of the main building will become irreversible within two years or so. The word famous Turoe Stone is just a few miles away: which may have been at the centre of a vast oppidum (town or settlement) that radiated for miles outwards from the Turoe area, and, historically, goes right back to the origins of Celtic Ireland (according to 40 years of research work carried out by Fr. Tom O'Connor). The Esker Riada runs right through the Parish of Bullaun & New Inn ("Sarsfield's Country") and, as it is roughly half-way between Clonmacnoise and Galway Bay, this 5 mile span of the ridge (which includes the Hill of Grange) was probably an important resting point from the earliest times for ancient travellers. For several years now, the people of Bullaun & New Inn have been saddled with the threat of a superdump being located at either end of their parish: the Celtic Waste one at the eastern end (near Woodlawn House), and, the Central Government one at the western end (near Turoe). The people trying to drive these superdump plans ahead appear to have NO REGARD for the fact that New Inn has already hosted a large rubbish dump for a period of 18 years (between 1971 and 1989), and that nobody seems to know what kind of toxic substances are at present seeping into the local water supplies: because nobody seems to know exactly what went into this particular dump during the 18 years it was in use. In addition, and as is plain for all to see, Galway County Council (who ran the New Inn dump) have left a mile-long string of eye-sores along this particular section of the Esker Riada: which they first destroyed (by removing large parts of it for its sand and stones), and then later dumped rubbish in. During recent years, numerous efforts have been made to bring the above local heritage information to the attention of politicians, lawyers, civil servants, and the media.